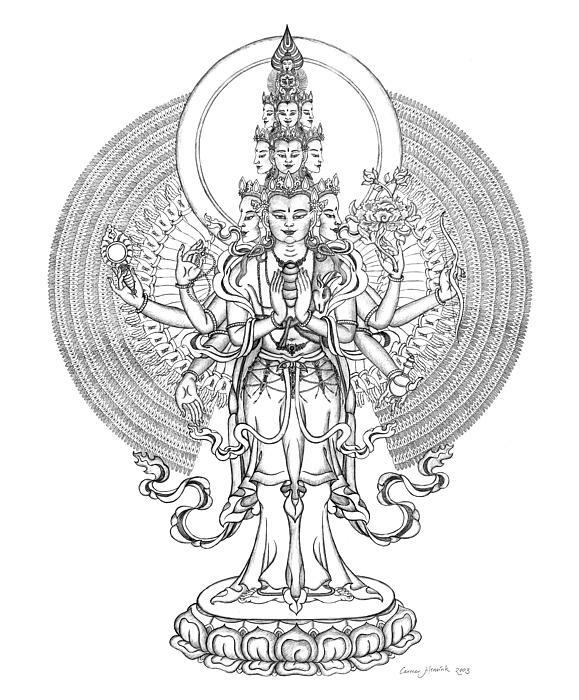 The one thousand armed Avalokitesvara or Chenrezig is another form of the famous meditation aspect of Tibetan Buddhism with the same name (which has 4 arms). Both aspects are manifestations of the pure and non discriminating altruistic compassion and connected with the king of mantra OM MANI PEME HOUN. 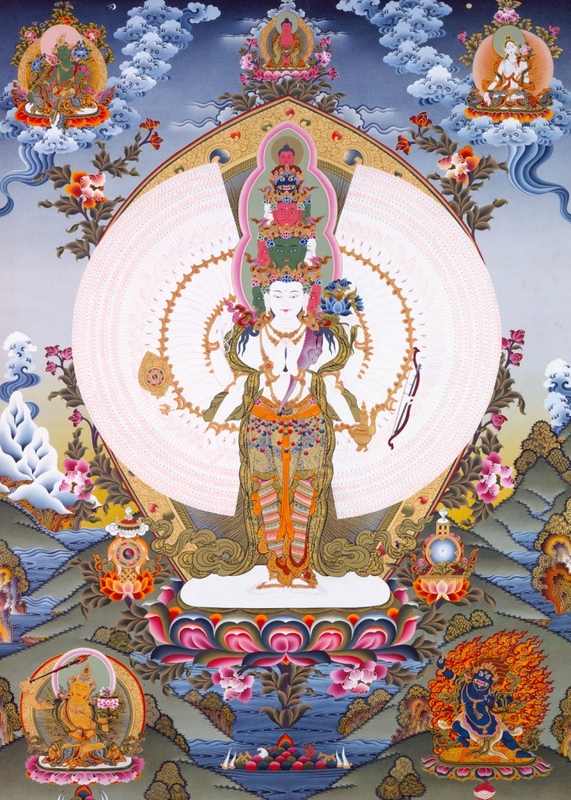 Particularly one thousand armed Avalokiteshvara connected with the special practice of Nyoung-Ne. He has eleven heads, each one look in every direction, and one thousand arms, each one adorned with an eye at every palm, which are constantly watching for where and how to be of most service to all sentient beings. Whenever he sees an opportunity, he immediately acts. In order to successfully do this practice it is needed to receive the according transmission and explanations. The empowerment – and the practice itself – belongs to the Kriya Yoga Tantra and it offers the opportunity and permission for each one that receive this transmission to do the practice and have the according and full benefit. A story based to this promise says that one day, after having liberated all beings from Samsara, he looked behind him once more where Samsara had been, only to see that Samsara was again filled with endless beings. In a moment of devastation, he became so disheartened that due to his former vow his body exploded into endless pieces. With the help of Buddha Amitabha his body was restored. Where his head was, eleven heads appeared and where his arms were, five hundred arms appeared at each side. Because of this, Chenrezig can now help even more beings and in multiple ways! 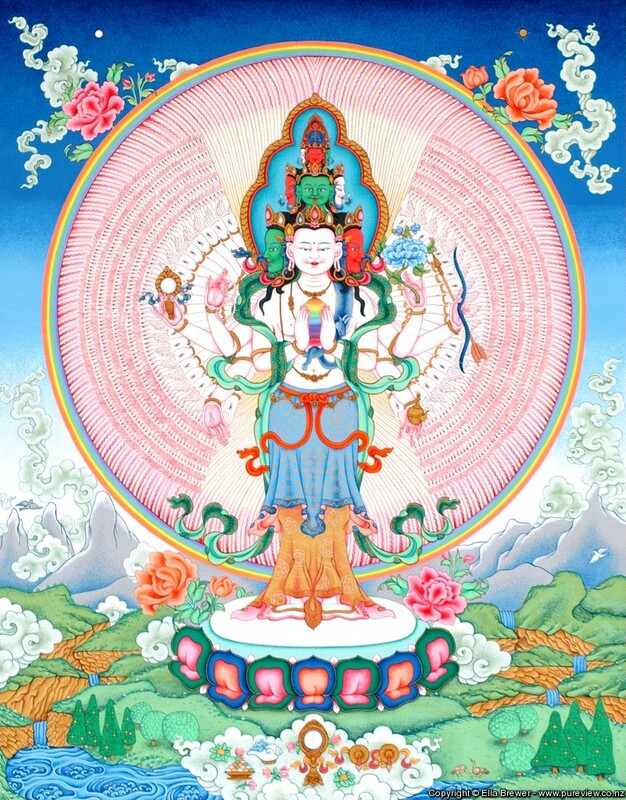 Nyoung-Ne is a practice related to Avalokiteshvara or Chenrezig, the Bodhisattva of great compassion but in the form that has one thousand arms. It is a powerful practice for purifying negative karma. The practice is done in a small retreat during which we refrain with our body, speech and mind from doing non-virtuous actions and at the same time we accumulate great merit in a short time. The practice includes taking the Mahayana precepts with the addition of complete fasting and silence on the second day for 24 hours. The small retreat consists of several meditation sessions per day, held over 3 days, Each session’s duration is about 2 hours and consists of recitations, meditation, mantra recitation, mandala and tantric offerings and prostrations. It is mentioned in sacred texts, that by doing even just one Nyoung-Ne in retreat one purifies negativities and it is equal to doing a three months retreat of other purification practices. It is so an extremely powerful practice for pacifying illness, purifying negative karma and opening the heart to compassion. The accomplishment of eight continuous Nyoung-Ne in a row is called “White Nyoung-Ne” and Avalokiteshvara promises that this person will at the time of his death spontaneously appear in the realm of endless bliss and light, the pure realm of Buddha Amitabha, Sukkhavati or Dewachen and will never fall gain and be reborn within the cycle of Samsara! ‹ TREHOR LAMA, Brief biography. ΤΡΕΧΟΡ ΛΑΜΑ, Σύντομο βιογραφικό.